Use this secondary break to transition quickly after the opponent scores, or after getting possession by either a rebound or steal. Push the ball up the floor quickly before the defense can get set. You can even use this as a press breaker if you get it in quickly, before the press has time to get set. The initial setup and lanes are similar to the "80" press break. This numbered break and the "80" and "60" press breakers complement each other well and are easy to teach together. 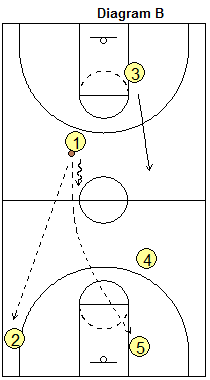 Use the "5-on-0, 5-trips drill". The numbered break has five (numbered) options. In practice, we run all five options up and down the court. Option 1. O1 making the dribble-move in the seam for the lay-up. Option 2. O1 passes forward to O2 for the shot from the corner. Option 3. O1 makes the long pass to O5 for the lay-up. Option 4. O1 passses to O4 cutting through the lane. Option 5. O1 passes to the trailer O3 for the outside shot. After the opponent scores... O3 gets the ball out of the net quickly and passes in-bounds immediately to O1 while O2, O4 and O5 sprint up the floor. Be quick, but stay under control and make no bad, forced passes. Diagram A. O2 runs wide up the sideline and sprints to the right corner. 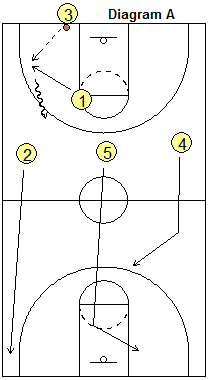 O5 sprints to the left block (5-spot). 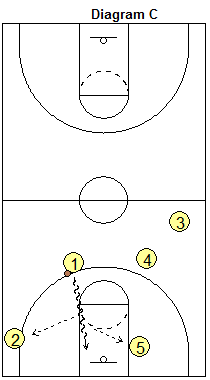 O4 runs to the area just above the left elbow, free-throw line area at the three-point arc. Diagram B. O1 speed dribbles up the floor and O3 is the trailer behind O1. O1 can make the long pass to O2 in the corner, or to O5 up the middle. O4 holds at the left wing. Or O1 can dribble up to the right three-point arc area, looking to make a move and take the ball all the way to the hoop. If O1 drives inside, he/she should look to score, or dish off to either O2 or O5 (Diagram C). O4 must read what O1 is doing. If O1 is able to take the ball to the hoop, then O4 delays and then trails O1 looking for the offensive rebound (Diagram C). If O4 cuts too soon, it clogs the seam and we don't give O1 a chance to make the dribble-move in the seam. We always like to give O1 the chance to attack the seam as our first option. But if O1 stops outside, O4 makes a hard flash cut to the ball-side block for the pass from O1 (Diagram D). Not shown here is the last option to O3. O3 trails and fills the left wing spot (after O4 cuts through). 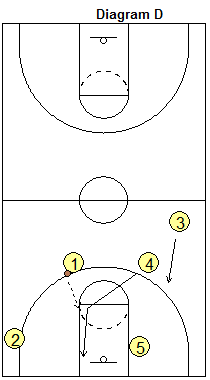 O1 passes to O3 for the possible 3-point shot. But, if nothing develops off the numbered break, then just flow into your usual half-court offense. 80-60-40 press breakers... all you really need.